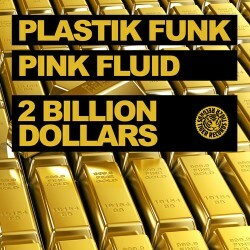 Plastik Funk & Pink Fluid – "2 Billion Dollars"
Doubling down on the duos today, John Dabel and Max Pagani of Pink Fluid team up with Plastik Funk’s Rafael Ximenez-Carrillo and Mikio Gruschinske for this electro house tune, coming out tomorrow on Tiger Records. Interestingly enough, both groups recently put out reworks of legendary tracks: Plastik Funk revisited “Blue Monday” with Kurd Maverick, while Pink Fluid found a cause to transform Bowie’s infamous “Rebel Rebel”. Today’s track, “2 Billion Dollars”, began with a melody crafted by John and Max, which then landed in Rafaek and Mikio’s hands and continued being passed pack and forth between the two groups until it was complete. As Plastik Funk asserts, the results are “100% the both of us, the perfect mixture". Kick back, relax, and enjoy the crisscrossing of metallic melodies and humorous vocals from this dynamic duo of duos.